Author Written by Velmurugan Saravanavelu and last updated on Posted on June 26, 2017 . Welcome to the tutorial about SAP reference operation set. This tutorial is part of our free SAP PP course. After reading this tutorial, you will learn what is a reference operation set and how to create it. Also, we will explain how to use a reference operation set in routings and what are the benefits of doing so. You will also learn about some real-life examples from the industry about using reference operation sets. 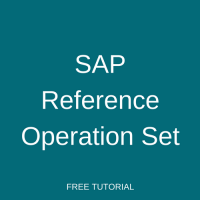 What is SAP Reference Operation Set? SAP reference operation set (ROS) is part of SAP PP master data which contains frequently used operation sequences for assemblies or subassemblies. The main function of SAP reference operation set is to avoid the need to enter operations and machine details every time when creating a new assembly. When a new SAP routing is created for an assembly, we can create it with a reference to SAP reference operation set. SAP reference rate routing is also similar to SAP reference operation set and will be used to define operation sequences in SAP repetitive manufacturing. The topics and points discussed for ROS in this tutorial are also applicable for SAP reference rate routing. When routings are created with a reference to SAP reference operation set, any changes in operations or timings can be performed in ROS directly. This way all SAP routings created with a reference to a particular SAP reference operation set will be changed automatically. It reduces master data maintenance efforts. If a new SAP routing is created by copying SAP reference operation set, then only operation details are copied to the routing and there will not be any link between the new routing and ROS. In this case, any changes in ROS will not update the routing created by copying ROS. ROS cannot be used directly in production as it is not created with reference to an assembly. Similar to routings, ROS will not have any BOM component assignment screen. Unlike routings, ROS will not permit parallel and alternate sequences. In SAP PP, routing, rate routing, reference operation set, reference rate routing and master recipe are called “Task lists”. They are referred as task lists because they contain lists of tasks that are needed to be performed to produce or manufacture a product. SAP system internally identifies each of them by means of task list types. Here is a table with task list types used in SAP PP module. SAP reference operation set is created and modified using the below transactions. Creation of SAP reference operation set and rate reference routing (RRR) is similar to creation of SAP routings and the only difference is that ROS and RRR are created without a reference to any material. Now, let’s go SAP system and access the transaction CA11. On the initial screen, if you leave the field Group as blank, the SAP system will assign an internal number automatically. If you want to assign an external name for group, type it in the Group field. Then press Enter. The next screen will be ROS header screen. Enter the following details in the header view. Now enter the unit of measure (UOM) for this lot range. This should be the same UOM of an assembly or sub-assembly in which we are going to create routing with a reference to this ROS. Next, click on Operations button. Enter the list of operations with activity times in sequences. Finally, click on Save button. Next, click on “Operations” button which will move you to the operations overview screen. Now, click on the menu Extras -> Reference-> Create. Then, enter the ROS group number. 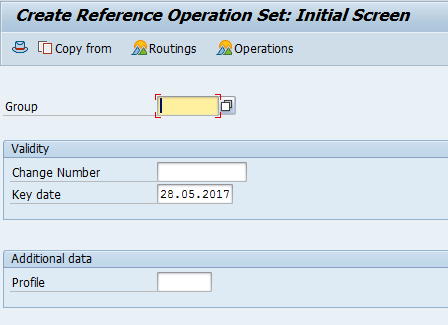 Now, operations of the SAP reference operation set will be transferred to the operations overview screen of the routing. It is often necessary to check where a particular ROS is used. We can check a special report to see what assembly/subassembly use a particular ROS with the following transaction. Whenever there is a change in operation sequences or machines, we can also create a new ROS and assign it to the existing routing which refers the old ROS. We can use the following transactions to replace the old ROS with the new ROS. This will be used when there is change in process or design or timing, etc. There might be also a business case when business wants a different set of operations for only few assemblies. In this case, we can create a new ROS and replace the old ROS only for those assemblies. There are different dimensions (length and diameter) and types of bolts produced in the industries. Here are a few of the types: track bolt, square bolt, plow bolt, round bolt, aircraft bolt, lag bolt, flanged bolt and elevator bolt. Since all the above types and dimensions of bolts are following the same operations sequence, we can create SAP reference operation set with these operation sequences and refer it whenever creating respective type bolts. When there will be a situation where the business wants a normal operation instead of a reference operation from ROS, it is necessary to remove (or delink) the reference. This can be done by choosing the following menu in edit routing transaction: Extras -> Reference -> Unlock, so that that the operation will be behave as a normal operation. For example, let’s say a square bolt require additional operations after the cutting operation where you can unlock the cutting operation and include an additional new one. 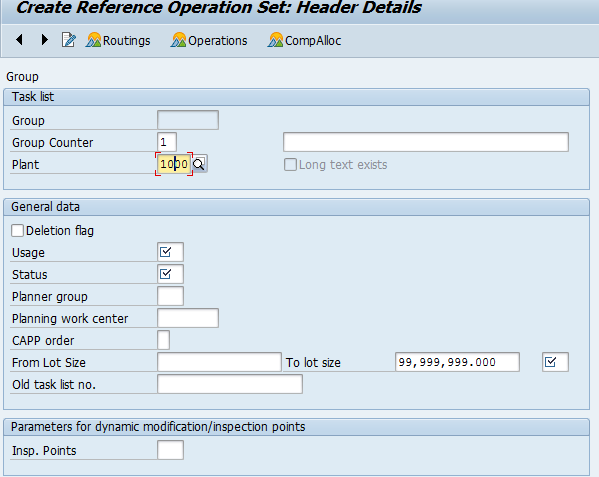 SAP reference operation set is also used in rework operations. When rework is identified during production for a particular operation, we can include rework operations needed to be performed using a trigger point. This operation will be defined in SAP reference operation set and included in a production order after the operation in which rework occurred using the trigger point. A trigger point executes a list of commands or instructions which will be performed when a particular event occurs. The command or instruction might be printing of shop floor papers, insert rework operation or create rework order, etc. In the shown above, let’s say there is rework identified after the zinc removal process. 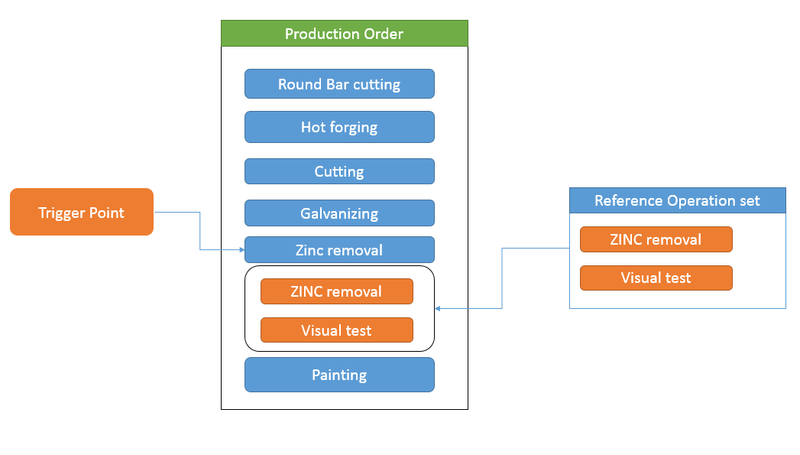 When rework is reported (EVENT) in zinc removal process, a trigger point assigned to this operation will be triggered and it adds/inserts two additional operations (zinc removal and visual test). These additional two operations are defined in the ROS and this ROS is linked to the trigger point. The trigger point is assigned to operations in SAP routing. Configuration and master data settings are required to do this which will be explained in another chapter. I think the problem is that you need to first select ROS that you’d like to delink and only after this follow the menu path. I selected the operations and then applied the Delink path. Could you explain me this step as i am unable to do it. In which transaction you are trying to do it? Can you please provide more details?